SUMMARY: Witty comments on dog behaviour and our dramatic attitudes to them. AUDIENCE: A beautifully designed, witty, cheeky little book about dog’s quirks for pretty much everybody. A coffee table book if there ever was one. Don’t pick this one up hoping for thorough research or a remote practical use. This one’s just for fun. REVIEW: This one was a welcome relief from the highbrow, science stuff for me. Actually, when it came to behaviour science, it kinda sorta mostly got it right. Only a few minor technical details here and there, but the general message is: use scepticism, common sense, and humour, when looking at your dog’s behaviour. 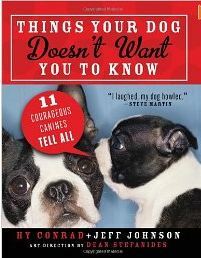 It’s generally no big deal if only you don’t insist on viewing it in the eyes of the latest en-vogue dog training theory. This book that is also beautifully designed (kudos to the artwork designer and photographer: a real gem), pocket-sized, and nothing short of hilarious. It’s basically a series of letters written by dogs to their owners, pet sitters, etc. about their antics. Message? Let’s not be so romantic, dramatic, prudish and anthropomorphistic when looking at our dogs. They’re animals and, as much as they love us, they are still driven by self-interest. It encourages us to de-dramatize their little behaviour querks and ‘traumatic’ past and see life as they do: day by day. Loved it. Clever, funny, high-quality design. Browse the Book Review archive. Genre: comedy. Book Authors: Conrad Hy, Johnson Jeff. Reading Level: Owners. Star: 3. Bookmark the permalink. Post a comment or leave a trackback: Trackback URL.